Renewables :: Coda Octopus Products Ltd.
Our unique real-time 3D volumetric sonar technology is revolutionizing this sector, increasingly becoming the most reliable solution for monitoring cable pull-in points and cable touchdown points. It is also used for all survey tasks on these projects, including pre- and post-cable and pipe lay survey, remediation, and protection. Visualize in all weather conditions. Through our real-time 3D monitoring, we can provide continual lay operations with effective decision making and planning. Coda Octopus real-time 3D volumetric imaging sonar solutions, based on our Echoscope® technology, have been integral to the success of the rapidly growing offshore wind energy projects in the UK and throughout Europe. Providing critical live visualization and monitoring in real time 1st person perspective, we cover the cable pull in points, cable catenary and conduct real time touch down monitoring. Channel and Route Clearance surveys are required for new construction projects such as pipe or cable routes, or for channel depth inspection to support deep draft vessels and assets. It is critical in both scenarios to provide unambiguous and high level of detail survey data to the operators in real-time to make essential decisions for remediation. Coda Octopus has been involved in dredging operations that have spanned some of the world’s largest trailing suction hopper dredger down to bucket dredgers deployed from a small barge. All operations, regardless of size, have been focused on ensuring site clearance has been performed to specification and in a productive and efficient manner. Performing Hydrographic Surveys requires contractors to place faith in the performance of a number of different sensors. At Coda Octopus we have over 15 years’ experience in delivering robust, reliable and repeatable solutions that have been the cornerstone for thousands of Hydrographic Survey operations worldwide. By providing operators with the invaluable ability to monitor operations live, the Echoscope® real-time 3D volumetric sonar and the CodaOctopus® Underwater Survey Explorer (USE) software have been used on subsea asset installation operations around the world, thus minimizing risk, minimizing downtime, and maximizing progress. In a number of subsea marine industries, the real-time monitoring of dynamic operations underwater is a necessity. Coda Octopus’s real-time 3D volumetric sonar, the Echoscope®, is capable of providing a live, 3D volumetric image of the subsea environment even in zero visibility waters. 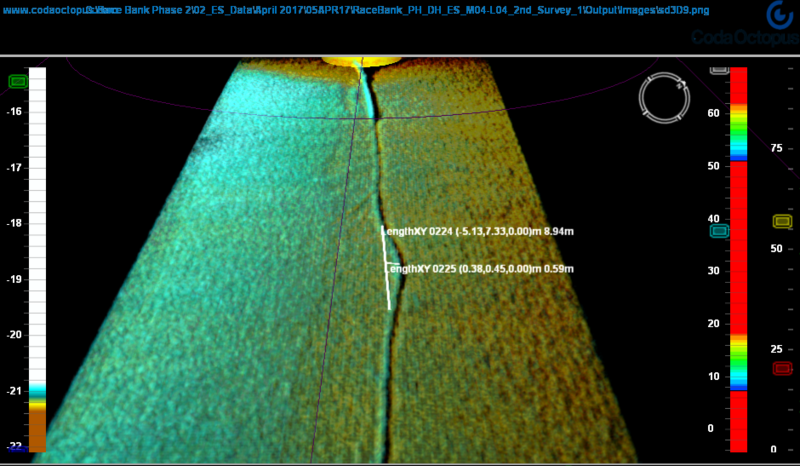 For cables and pipelines that require trenching and backfilling, the Echoscope's proprietary technology produces a live, 3D real-time visualization of moving operations underwater even in challenging conditions, where strong currents or turbid waters threaten operational timelines.